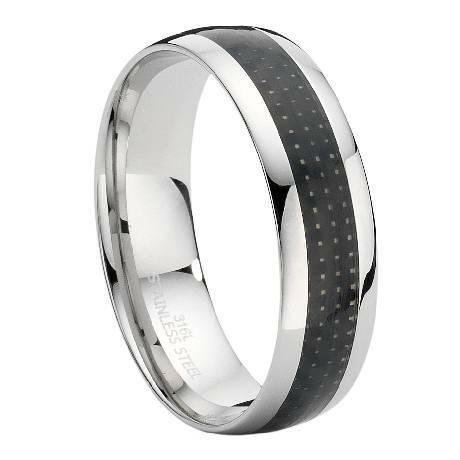 The chrome shine of this handsome ring provides striking contrast to the smooth black carbon fiber inset that wraps around the band.One cannot help but find a feeling of calm in observing the contrast between the two materials.This is an excellent choice for any reflective gentleman.Note: Comfort Rings are usually 1/2 size smaller. We recommend having your finger measured for a comfort fit ring at your local jewelry store first to ensure the correct fit. I got this for my boyfriend as a pre-engagement ring. He loves it! It looks as higher quality than sterling silver and still has no blemishes. The design is much nicer in person than on the screen. So glad I made this purchase. 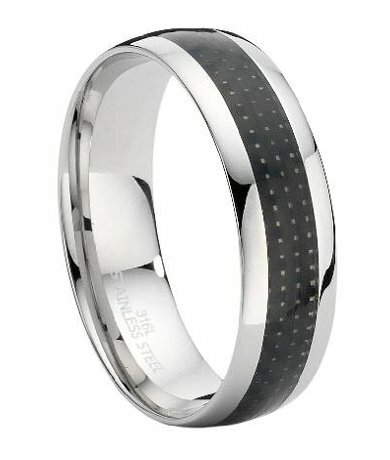 I am very impressed with the service received from justmensrings.com. When I first placed my order, the ring arrived in a timely manner, but it was slightly too big. So I returned it, expecting it to be replaced within a week or two. The replacement ring arrived within a week, with no issues. The quality so far is very good, especially for a man who isn't used to wearing rings and tends to smack it against things regularly. It's also a lovely piece of jewelry. Thank you!! For our 11th anniversary which is the stainless themed gift I decided to give my husband this ring. Not having really ordered jewelry online I wasn't sure what to expect. When it arrived I was pleasantly surprised. The combination of the stainless steel with the carbon fiber is really unique and modern. My husband absolutely loves it and gets tons of compliments on it. He affectionately calls it his sports car ring. This ring looks far more expensive than the price. Extremely satisfied. I purched a ring or my husband at christmas time he love it .My son a new daddy thought he would like a ring, so for fathers day I got him this ring and once again IT WAS THE PERFECT GIFT .